A protester holds blood-stained images of government figures during a demonstration against the annulment of Law 180 in August 2017. Last month, two indigenous Bolivians, Fabian Gil and Marqueza Teco, travelled to the UN Climate Change Conference in Bonn, Germany to denounce their government. 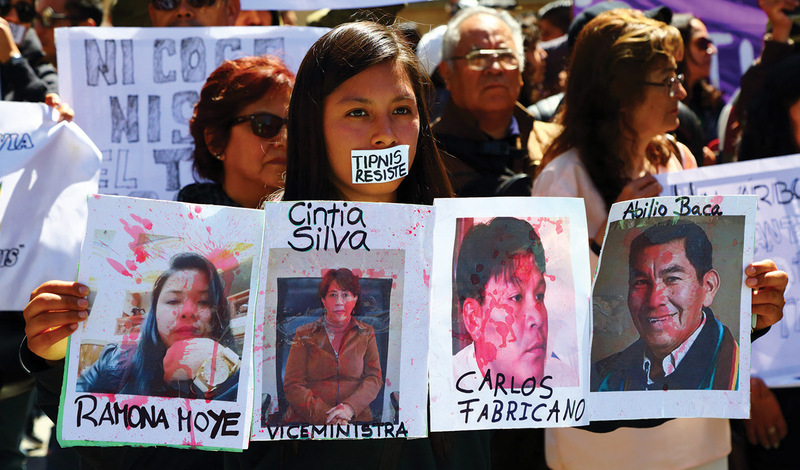 In front of the International Tribunal for the Rights of Nature – a symbolic court held on the fringe of the conference – the activists presented evidence against President Evo Morales, who has revived plans to build a major highway through the protected TIPNIS ecological reserve. Although governments railroading indigenous people in the name of ‘development’ is nothing new in Latin America, this conflict is different: Morales is the country’s first indigenous President and was once seen as a champion of environmental policies. Covering over a million hectares, TIPNIS is home to indigenous people from 69 communities, including the Moxeños, Yuracaré and Chimán peoples. Many are resisting the proposed highway, saying that it will cause deforestation, enable the exploitation of oil and gas and cultivation of coca. ‘These activities may put at risk one of Bolivia’s most important ecological lungs,’ says Gil, who is president of the TIPNIS communities. In August 2017, the government effectively annulled Law 180, which had protected TIPNIS and declared it ‘untouchable’. The law was passed in 2011 following the first wave of anti-highway mobilization, which included a 360-mile protest march from the Amazon Basin to Bolivia’s capital city, La Paz. The state’s volte-face on Law 180 has sparked a new wave of protests, vigils and sit-ins across the country. The Bolivian government was the first in the world to endow the natural ecosystem with personhood when it passed the ‘Laws of the Rights of Mother Nature’ law in 2010. As far as the protesters are concerned, Morales is now violating the very rights of Mother Nature that he helped enshrine. Morales has increasingly come into conflict with Bolivia’s indigenous people over oil, gas and hydroelectric projects. He has labelled the resistance to TIPNIS a ‘colonialist environmentalism’, which is ‘not interested in the indigenous movement having electricity or [Bolivia having] highways’.